Easy to take the tram to the city Stadt. Was excited to see Graz! Everything is perfect. 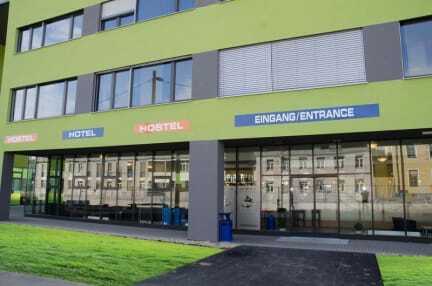 But it's more a hotel than a hostel of course. No atmosphere for meeting fellow travelers or anything like that. It's next to the train station. The staff is very nice and the breakfast is rich. On the other hand, as it turned out, we had to pay for the sheets and they didn't have free locks for the locker. All over it's a good opportunity to have a place to sleep for a quick stay in Graz. Located by the main railwaystation its perfect to reach for a stop of a longer journey. The center of the city (old Town) can be reached per feet (longer walk) or public transport. The staff is very friendly and helps out in many ways! The rooms are big and clean, but not cozy. They are ok! Location was good close to the train station and 10min walk from the centrum. Dorm was huge and very clean, but the atmosphere was quite cold and felt more like a hotel. You have to pay extra 3,5eur for the sheets. Location was not good, but worth it. And if you want bed cover, you have to pay . Had to put a diposit down for the kitchen which i didn't do in the end but a hostel that just felt like a hotel so wasn't my kind of place. If was somewhere to stay while I saw the city though. There were some red bugs in my bed which is so unsanitary, I reeeally hope I am an exception and this doesn't usually happen. Also, beds creak way too loud. Location is good and if you're just needing a bed for the night then it will be suffice, however this is more like a hotel and there's not any atmosphere to speak of. You have to pay for your own bed sheets which the receptionist didn't tell me about so I had to go to my room and then back down to purchase. The breakfast is over priced and don't believe the "all you can eat buffet". It's cereal, bread and a few thin sliced meats. With poor coffee. Sufficient for a nights stay but nothing else.